It can be hard to find desserts that aren’t overwhelming or “too” unhealthy. 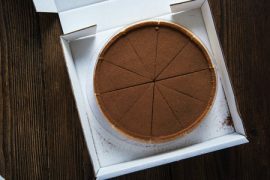 For those who continue to struggle to find suitable desserts, this banana coconut chocolate tart is a great place to start! Lacking any artificial ingredients or added sugar, this recipe instead uses Manuka honey to provide a rich, sweetened flavor alongside ingredients that pair well together but aren’t used together as much as they ought to be. From the banana to the cocoa powder, this dish is one you’ll want to keep around for the future. Without further ado, let’s get started on that banana coconut chocolate tart! Pie crust: Start with the almonds and process them inside a food processor until they are coarsely chopped. While the machine is going, add the vanilla, the water, the dates, and the sea salt until a sticky dough has formed. From there, stop the machine, scraping down its sides if needed, so the almond mixture can process easily and form the right dough-like texture. With the pie crust ready to go, press it firmly into a parchment-lined, 8×8-inch tart or baking pan to form the thick crust up the pan’s four sides and across the bottom. In a blender, add the sliced bananas, the cocoa powder, the coconut milk, the Manuka honey, and the vanilla. Set to puree until the mixture appears to be smooth. When the banana mixture is ready, pour it into your pie crust and then sprinkle it with the cacao nibs and the slivered almonds. Cover the tart with parchment or wax paper and then freeze it for eight hours minimum or overnight. After it’s had time to freeze, thaw out the tart on your counter until it is soft enough to be cut into at least nine squares, which should take about 45 minutes minimum. If you have any leftover squares after serving, feel free to store them in your freezer inside a sealed container for up to five days. Beekeeper Has One Unique Maternity ShootWhat is a Chinese Striped Hamster?